Newport Harbor Light at sunset (7:03 PM EDT) on September 17, 2012 on the grounds of the Hyatt Regency Newport on Goat Island in Newport, Rhode Island. This image comprises multiple photos stitched and blended together to form an ultra-high-resolution, high dynamic range panorama that is over 165 megapixels. The Boston, MA skyline as viewed across Boston Harbor from the Boston Harbor Shipyard & Marina pier in East Boston. Captured just after sunrise, this image includes the "supermoon" of June 2013 setting on the left side of the picture. This image comprises multiple photos stitched and blended together to form an ultra-high-resolution, high dynamic range panorama that is over 105 megapixels. Annisquam Harbor Light Station at Wigwam Point in Gloucester, Massachusetts during late afternoon in the summer. This image comprises multiple photos stitched and blended together to form an ultra-high-resolution panorama that is over 82 megapixels. 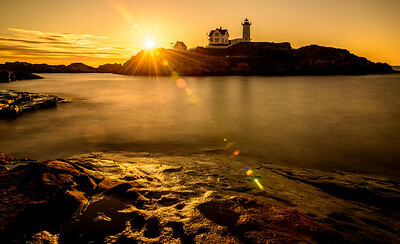 Cape Neddick Lighthouse ("Nubble Light") backlit by a stunning sunrise at 5:20 AM on July 13, 2011 at Sohier Park in York, Maine. This image comprises multiple photos stitched and blended together to form an ultra-high-resolution, high dynamic range panorama that is over 109 megapixels. Moonrise during "Christmas in July" on August 1, 2012 at Cape Neddick "Nubble" Lighthouse. Created by stitching 10 vertical frames, each created from 4 exposure brackets, for a total of 40 source images. Cape Neddick Lighthouse ("Nubble Light") just before a cloudy sunrise (5:02 AM) on July 13, 2011 at Sohier Park in York, Maine. This image comprises multiple photos stitched and blended together to form an ultra-high-resolution, high dynamic range panorama that is over 126 megapixels. 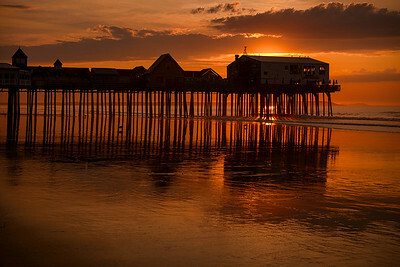 The famous pier on Old Orchard Beach at sunrise. 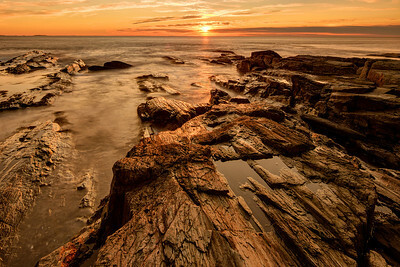 Golden sunrise illuminates a rocky outcrop near Two Lights State Park in Cape Elizabeth, Maine. Pinks and yellows burst through a gray, cloudy sky during sunrise at 5:02 AM on July 26, 2012 at Portland Headlight in Fort Williams Park in Cape Elizabeth, Maine. This image comprises multiple photos stitched and blended together to form an ultra-high-resolution, high dynamic range panorama that is over 105 megapixels. 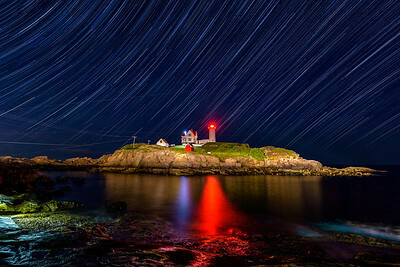 Portland Head Light at sunrise (4:52 AM) on July 28, 2012 at Fort Williams Park in Cape Elizabeth, Maine. This image comprises multiple photos stitched and blended together to form an ultra-high-resolution, high dynamic range panorama that is over 115 megapixels. 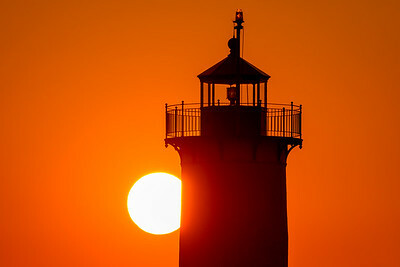 An ultra-high resolution, high dynamic range (HDR) panorama of sunrise at Fort Pickering Light (also known as Winter Island Light) on Winter Island in Salem, Massachusetts (MA), taken at 6:40 AM on Saturday, April 12, 2014.